His father dead by fire and his mother plagued by demons of her own, William is cast upon the charity of his unknown uncle – an embittered old man encamped in the ruins of a once great station homestead, Kuran House. It’s a baffling and sinister new world for the boy, a place of decay and secret histories. His uncle is obsessed by a long life of decline and by a dark quest for revival, his mother is desperate for a wealth and security she has never known, and all their hopes it seems come to rest upon William’s young shoulders. But as the past and present of Kuran Station unravel and merge together, the price of that inheritance may prove to be the downfall of them all. The White Earth is a haunting, disturbing and cautionary tale. To understand the novel The White Earth, we need to consider the historical context of the book. It was published in 2004 but set in 1992. It is set in rural southern Queensland in the year of the Mabo decision that declared the historical excuse of Australia being Terra Nullius (an empty land ready for settlement) was legally deemed to be unacceptable. There were calls for Reconciliation, and calls for an acknowledgement of the past suffering of Australia’s first people. The novel comes at a time of heightened feelings, preceding the Kevin Rudd apology to the Stolen Generations in 2008. It is also a time of the formation of the exclusionist One Nation Party, in a rural Queensland setting not far from the setting of the novel. By setting his book in the same region as the One Nation Party and also embedding a colonial history through the sage of the White family and the history of Kuran House, McGahan has shown how this exclusionist view of Australia is part of a longer colonial legacy that has to be broken. We need to include Aboriginal people and Torres Strait Islanders in our communities so that we can all learn from one another and develop a real awareness, understanding, appreciation and respect for the culture and history of Indigenous Australia . . . Its basis is the inclusion of the Indigenous peoples of Australia, not their exclusion. And that is healing for all of us. If we consider this call for ‘appreciation’, ‘respect’ and especially ‘healing’ we see the novel as providing more than just a criticism of past actions; it joins other calls for reconciliation and is therefore an important political text. The White Earth it just drifted along out of lots of ideas. I’d been researching the Darling Downs for my own personal interest, the history of it, black and white. It was– when I first thought of this it was the mid 90s, it was the time of Pauline Hanson, the rise of Pauline Hanson. It was the time of the Wik decision. Native title had come in 93, Wik was in 96. And there were all sorts of fears and panic flying around Western Queensland about what, what’s it going to mean to our properties and all that sort of stuff. There were these little right wing groups coming out of the woodwork, militias and things. There were rumours of the Klu Klux Klan having meetings in the Darling Downs – which I don’t think was true but it’s a great image so I added it to the book. All this sort of stuff was just swirling around and then there was this great big house there to use as a focus of it all, this ruinous old house that I’d imagined it as. And so the story was there. Andrew McGahan was born in Dalby, Queensland, but has lived and worked mostly in Brisbane. His first novel Praise (1992) was winner of The Australian/Vogel Literary Award. Since then his writing includes an award-winning stage play, Bait, and the AFI award winning screenplay for the movie version of Praise. His second novel was the prequel 1988 (1995), and his third novel Last Drinks (2000) was shortlisted for multiple awards, including The Age Book of the Year and The Courier Mail Book of the Year, and won a Ned Kelly award for crime writing. 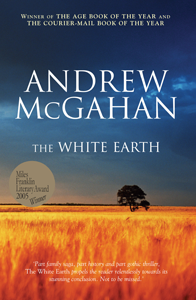 In 2004 The White Earth was published and went on to win the Miles Franklin Literary Award, the Commonwealth Writers’ Prize for the South East Asia and South Pacific region, The Age Book of the Year (Fiction) and the Courier Mail Book of the Year Award. It was also shortlisted for the Queensland Premier’s Literary Awards that same year.